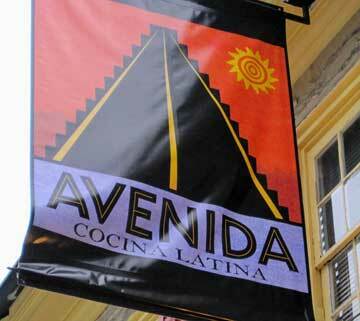 Chefs Kim and Edgar Alvarez opened Avenida just before winter last year, in the spot where Cresheim Cottage Café had resided. The adventurous chefs, husband and wife, are at the top of their Latino culinary skills in this venerable 18th century Mount Airy locale. 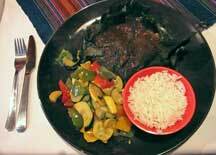 Who would have guessed that Guatemalan cuisine could migrate so cordially to the cobbled streets of Germantown. If your cartographic eyes happened to be heading toward the Panama Canal from the Gulf of Mexico, you’d pass by Belize and Honduras into the Caribbean. Those countries abut Guatemala on its eastern border, with Mexico and the Pacific Ocean at its northern and western edges. The DNA of most Guatemalans is helixed with strings of ancient Mayan and Spanish conquerors’ configurations. Therefore it is customary to envision meals punctuated with what geneticists expect: enchiladas, guacamole, tamales, empanadas and tortillas. The Alvarez’s have crested with added styling to make wonders from a maze of maize. You enter the restaurant into a small area where a wooden shining bar welcomes your appearance. To the left is a “fireplace room,” and to the right a “garden view room.” Prefer the latter for less noise and maroon crisp neatness. Venture into the former for more bustling but balmy benchmarks, including Central American orange colors. Gold, silver and copper-framed mirrors abound throughout, as do folk-art plates and starched white tablecloths upon which rest miniscule lit votive candles. Globe lamps drop additional light, causing the tiniest shadows from a circumference of wooden thin chair rails. 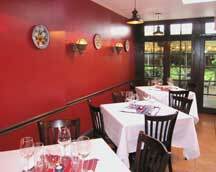 Upstairs dining is also available in smaller, more private areas. Ordering two Appetizers for a table of four should get you started in the appropriate direction, allowing for the stuff of amply portioned Entrées thereafter. Crispy Tortilla Chips with guacamole and dos salsas ($6) accompanied by Fried Calamari ($8) engulfed with onions and jalapenos in tomatillo sauce, should acquaint your tongue with languishing in heated, lime-laced solidarity and liquidity. Your teeth chatter and chomp as if doing a flamenco dance. To add to the adventure, you may wish to sip a Cristalino Cava Cocktail with splashes of grenadine and guava ($9), or a Tequila Sunrise ($9) so impaled with squeezed fresh orange juice that your eyes dilate from the glare. Entrées are superlative. Roasted Chicken Mishote ($16) is served on a dark plate where the mahogany tones of the roasted chicken thighs are highlighted by exuberant well-oiled greens, reds and yellows of sliced leeks, peppers and yellow squash. And in a pink bowl on the same plate is a mound of gleaming white rice. The thighs’ skins are laden with spice and softly rounded underneath in charred chunkiness. The flesh melts from the bones and melds in your mouth with the soothing vegetables and starchy parcels of rice (“con arroz”). Duck whenever you can. At Avenida, “ducking” will become a habit. A hearty, thickly sliced succulent breast is dusted with Ancho chili powder, and creatively carved amongst scored canela sweet potatoes and sautéed emerald-colored watercress ($18). The results are startling orderly flavors, richly engorged, then sweet, then verdant. Achiote Grilled Shrimp and Scallops ($19) are served between and on top of chayote and ivory white grains of quinoa , upon a plate artfully displayed as a Mayan headdress with drizzles of sauce and lime wedges. The chayote squash lubricates your upper palate while the achiote spices provide a virtual sense of underlying Yucatan surprises upon it. The shrimp bounce joyfully from cheek to cheek while the scallops, in lime and in limine, add tartness. Lime is of the essence. 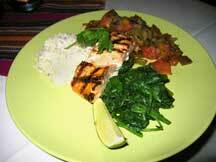 Grilled Salmon ($18) is cross-hatched to perfection and coupled with glistening steamed white rice. Sidekicks of watercress and stewed veggies abound. Flavorful and like satin, the salmon seems to flake wetly at the tip of your fork. Trembling, it reaches your mouth, dissolving therein. 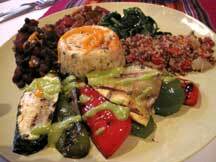 Many patrons even press the salmon upon the face of a round warm tortilla (supplied gratis in heated towels at all tables), smothering the fish with rice and greens. They fold and swirl the mélange into a veritable wrap for ecstatic devouring. By the way, never, ever hold the tortilla towels above the omnipresent votive candles: squirting canisters of fire extinguisher hoses are the only antidote. Vegetarians and all others “oooh” and “aaah” at the Vegetarian Tamale ($15), a cupcake of jelled racey-ricey ingredients superbly surrounded by a serape of vibrantly colored slices of seasoned eggplant, zucchini, tomato olive recado and assorted sautéed carrots, peppers and black beans (“frijoles”). By just gazing upon the platter, you get that “Dorothy feeling” that you’re not in Kansas anymore. The vegetarian concoction is out of this world. I won’t mention Avenida’s Dessert Menu except to say that authentic Guatemalan coffee ($3.50: regular and decaf) is enhanced in geometric progression by bites from an Ancho Brownie Sundae ($6) melting in marshmallow sauce and chocolate ice cream, or by spoonfuls of Caramel Pudding ($6) in which whole Mexican wedding cookies have been embedded. Annie and I devoured 45 of such lovely, loving cookies to celebrate our latest wedding anniversary. TSUM GLIK, TSUM SHLIMAZEL, OLÉ!